There are few unaltered places left in the world where you can go and really have a sense of wonderment along with a feeling of what it must have been like before man started altering the landscape. On our last family vacation, we visited the Upper Peninsula of Michigan. Although populated to some degree, there are still vast areas of forest that travel along dunes and beaches of fresh water lakes and shorelines meant to explore. 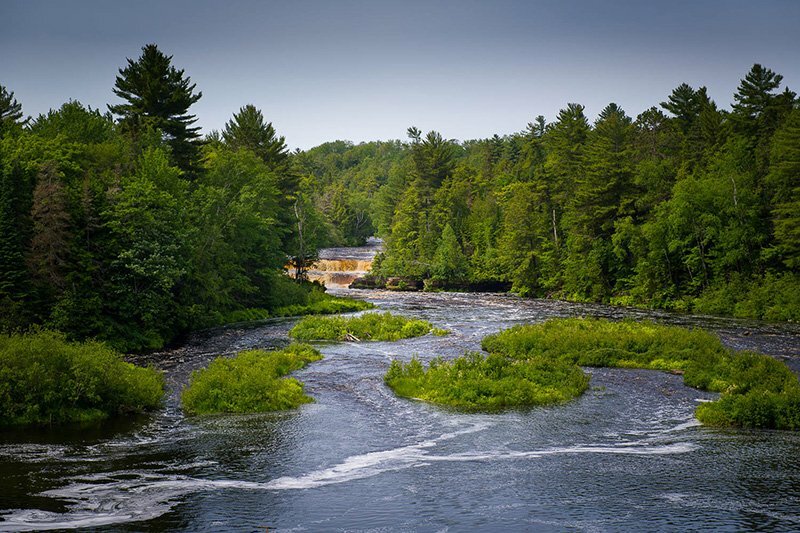 One such natural wonder are the Upper and lower falls of Tahquamenon. As we set out to view this spectacular waterfall, the day was perfect. Sunny, 55 degrees in the early AM, (warm for the UP) with a predicted hight getting near 70 for the day and nothing but blue skies. 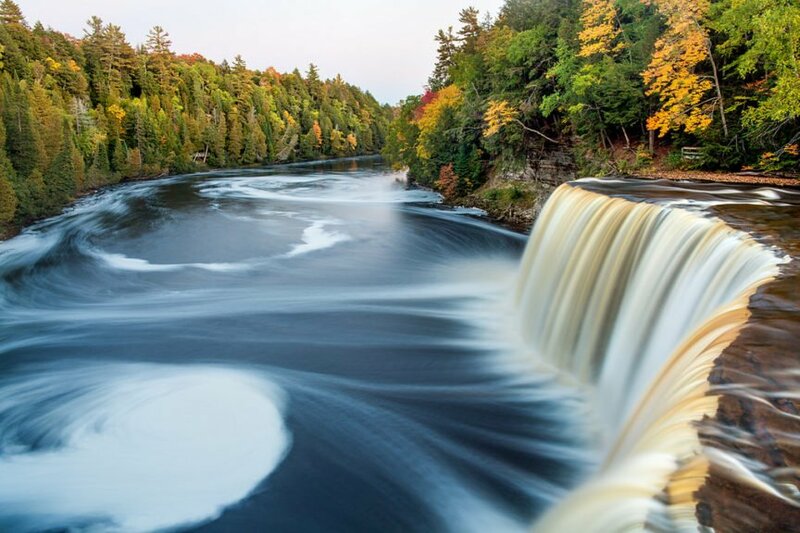 Tahquamenon falls are located within a national park with paved walkways, rails and viewing platforms. The remainder of the landscape is untouched. Maintained by Mother Nature and the critters that are lucky enough to dwell in it. When you first arrive, you can hear the falls rushing from quite a distance. Excitement builds as you walk down the path to the beginning of the trails. Chipmunks darting across the path in front of you and birds flitting about lends to the feeling you are about to see something special. It pops into view and you can see the rusty colored water spilling over the falls, churning the water into foam at its base. The power at which the water rushes over the edge is really something to see and hear when you are standing so close that you can feel the mist of the falls. Taking it all in for a moment you realize that this has been happening for thousands of years in the same manner and this is just the beginning of the flow. There is more to see as is snakes its way further down the landscape to the lower falls. Not as impressive as its big brother the upper falls, the lower falls are more tranquil transitioning into a larger basin area that allow for kayaking, canoeing, catch and release fishing along with simply enjoying the view. This is where people tend to congregate and admire all that nature has to offer. Sites and sounds the remind you to relax and let whatever stress you may have melt away. Places like this allow you to reconnect with creation and remind us that we need to ensure this stays around for generations to come.